Can you connect Adobe Lightroom with Envira Gallery? This was among the top feature requests that we got from our users. After the redesign and launch of 6 new addons, our team went to work with a single mission: allow users to upload photos from Adobe Lightroom to WordPress. Today, I’m extremely proud to announce the launch of our new Adobe Lightroom Addon that allows you to connect Lightroom to WordPress, so you can streamline your workflow. With over 289,000 downloads, Envira Gallery is the best WordPress gallery plugin for photographers. Adobe Lightroom is one of the best photo editing software for photographers. So it made sense to combine the two and give our users what they want. Starting today, Envira’s Adobe Lightroom addon is available for everyone with a Pro or Ultimate license. You can now upload photos directly from your Adobe Lightroom into WordPress. The Lightroom addon allows you to create and synchronize your Adobe Lightroom Collections with your WordPress galleries. Yes, you can create, sync, and delete galleries straight from Lightroom. We have a step by step guide on how to connect WordPress with Lightroom. The setup only takes a few minutes, and it’s very easy to use. 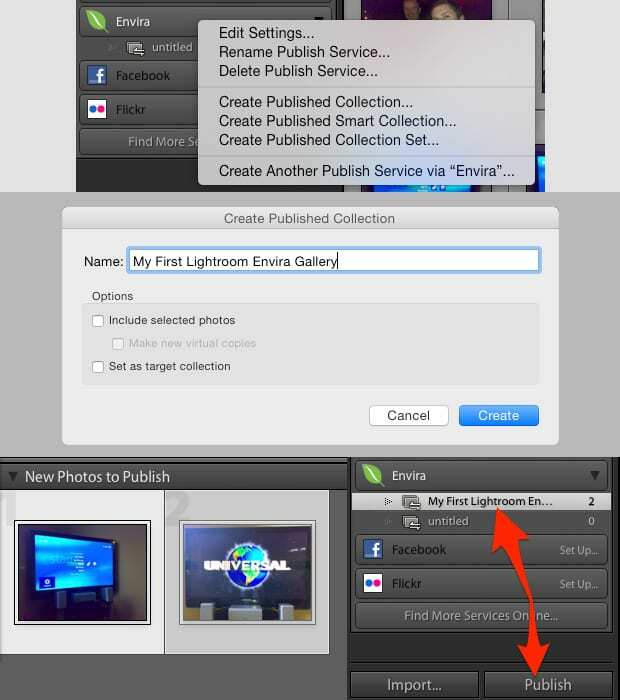 Start using Envira Gallery today and try our Lightroom Integration for WordPress. We want to give a special shout out to our friends over at Adobe for helping us through out the process. Without their help and support, this integration would not have been possible. We also want to give a shout out to our VIP users who agreed to beta test this feature. We really appreciate your patience and support through out the process. Lastly, thank you everyone who ever sent a Lightroom feature request. We really value your feedback, so please keep sending us new features that you would like for us to add. I hope you enjoy using the new Lightroom Addon. I along with the entire Envira Gallery team look forward to helping you create beautiful responsive photo and video galleries. I can’t wait to set this up and use this product. I have been publishing from Lightroom to WP with WP/LR sync. It is slow and loads only to media. With this product I can create the gallery all in one step and maintain it entirely from Lightroom. Absolutely – do let us know if we could be of any help with the setup. I have been using this since the introduction and it works great and is a huge timesaver. Congratulations to the Envira team for getting this out and doing it well and right. Very nice. Envira is really stepping up the game in 2016. I can see using this in so many ways. Combining this with the Proofing Addon to create a really nice workflow for a photographer interacting with their clients. Awesome news and can’t wait to test this out. This is great! I’m a WordPress Designer by day and a prosumer/part-time photographer by night. But I use lightroom primarily to manage pictures, images and galleries for myself and clients (when building new sites) I’m looking forward to testing it out . . so I started the install/test process. It’s requiring WP Rest API 1.0 > https://wordpress.org/plugins/json-rest-api/ which has been deprecated and replaced by 2.0 > https://wordpress.org/plugins/rest-api/ While 1.0 is supported for security fixes only, I’m never a fan of using outdated plugins. It’s only a matter of time before 1.0 becomes totally obsolete. There were some missing functionality that we needed for WordPress to Lightroom connectivity in v2 plugin at the time of development (December). v2 of the API was still in beta, so we chose to work with v1 for the time being. We have a ticket open in our project roadmap to recheck with v2 and if possible start using that right away.